I hope you're all having an awesome bank holiday weekend! Today I have my next Father's Day Gift Idea installment and we are going to be looking at some really usable and functional gift ideas your dad will hopefully like from Thermos. First are the food flasks*, these are absolutely perfect to take to work and can keep food hot OR cold! So whether it's fresh fruit or hot pasta or even soup, they will stay at that temperature for up to 7 hours for hot food or 9 hours for cold which means you can prepare stuff in the morning and be safe in the knowledge that the food will be fine for lunchtime or even as a late afternoon snack. They come in the smaller size above which is 0.47 L or also a larger size which is 0.71 L.
Next are the radiance cool bags, these come in individual, medium, family (image below) and large, and they store anywhere between 6 and 36 cans depending on the size. 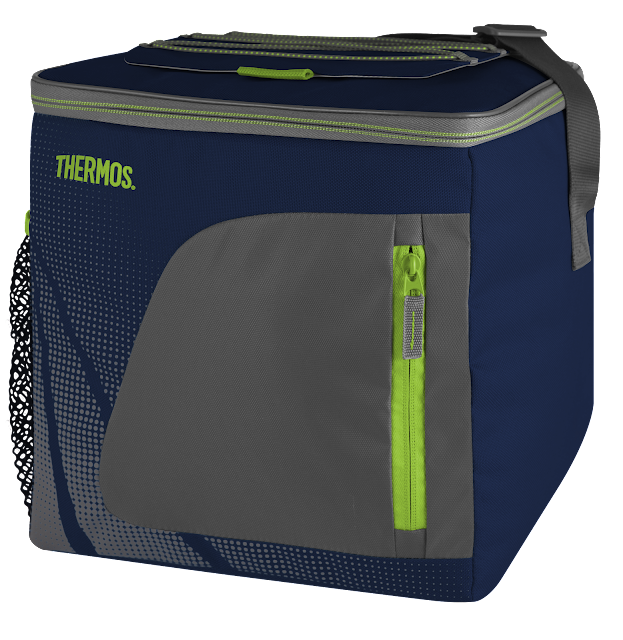 You place ice packs or freezeboards inside to keep the cans cool, then are set for a nice day out with everything all kept together in a bag with a handy shoulder strap. Lastly there are the classic Stainless King Flasks which come in matt black, red or blue and in the 1.2 L or 0.47 L sizes. These have an amazing 24 hours hot or cold capacity so you can have tea, coffee, soup or juice and I take mine to places like theme parks or car boot sales to save on money and have my favourite drinks wherever I am. I hope you all liked my picks, all of them are super practical and something that anyone can use. My experience with Thermos is that their products are incredibly durable and amazing insulators, and I 100% testify to the high levels of quality. You can check out the full range here for all the products available. I adore the food flask, i use it often for my lunch! I liked the idea of the thermos flask and the cool bag! I think they are so good for a picnic, and I am sure not only dads would love it - I would!